The Compass Company is proud to offer our own designer collection of Compass Pendant Necklaces. The Compass Pendants in our collection were each designed and are hand cast in the United States. 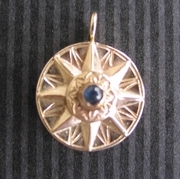 A 14K Gold Compass Rose Pendant that will surely become a personal talisman and heirloom. These 14K gold compass rose pendants are available in two sizes. C1-14K features a 20MM compass inset. CN3-14K is set with a 15MM compass and features a small sapphire cabochon on the top face.